Making inferences is an important part of reading comprehension. An author does not necessarily put everything in print for everyone to read. Yes, you may infer at this moment and extrapolate that doing so requires too many words and simply leads to a wordy or long-winded article. Readers prefer concise sentences. Consequently, as early as the elementary years, students need to be taught to make inferences. Inferences should not be equated to guessing or reading too much between the lines. Extending too much from what is either directly stated or implied in text can be misleading when it comes to reading non fiction especially science literature. Inferences must be based on what one actually has read. "The waiter dropped a plate. He quickly went to get a dustpan and broom." Here are possible questions for each of the three categories. Factual Recall: "Who dropped a plate?" or "What did the waiter drop?" Bridging inference: "Who is 'He' in the second sentence?" Pragmatic inference: "Where did the plate land, and did it make a mess?" "Bridging" is basically text-based (T) while "pragmatic" is elaborative (E) as it draws from either one's experience or general knowledge. 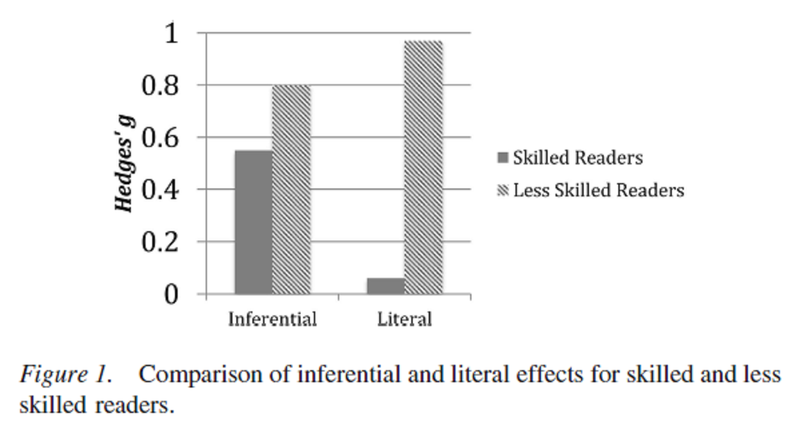 Text-based inferences require a reader to see the connection between sentences (either with the use of pronouns or connecting the ideas between sentences even when words like "therefore" or "because" are missing). Elaborative inference, on the other hand, embellishes what is written. For example, reading the phrase "the sky is blue" can create an image on the reader's mind that "it is simply a gorgeous sunny day". Examining the Impact of Inference Instruction on the Literal and Inferential Comprehension of Skilled and Less Skilled Readers: A Meta-Analytic Review. The studies that show large effect sizes have been encircled in red. 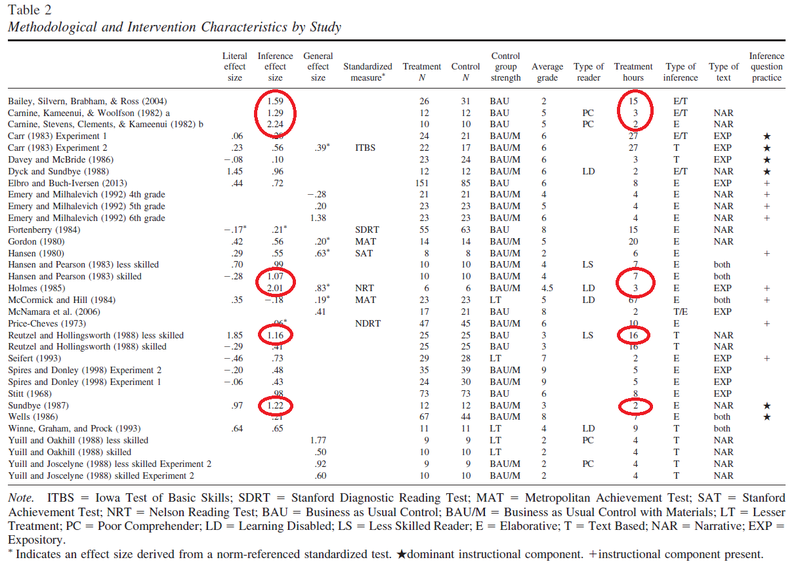 Judging from the treatment hours for each of these highly effective interventions, one cannot really see a correlation between time spent and effect size. The study that has the largest effect size (Carnine, Stevens, Clements, & Kameenui (1982) 2.24) takes only two hours while interventions with 15 and 16 hours produce only 1.59 and 1.16, respectively. This perhaps shows that it only takes a short time to improve a student's skills in making inferences. This improvement is more likely to be due to understanding how pronouns work and how sentences get connected to each other (text-based inference). The lack of further improvement with increasing instructional time probably lies in elaborative inferencing for this requires knowledge, which obviously requires much more than 15 hours to grow.